As the death toll from last week’s disaster neared 200, the Government yesterday stepped up its relief and assistance commitments to affected communities. With the country slowly recovering from the calamity, foreign assistance poured in from countries responding to the Government’s appeal, with the third shipment of relief items sent by India arriving yesterday along with shipments of relief supplies from Pakistan and Israel. According to the Disaster Management Centre (DMC), 196 people have been confirmed dead while another 94 are reported missing with 575,816 people from 149,678 families affected by the disaster. The monsoon conditions prevailing over the country on 25 May caused severe flooding and landslides in 14 of the country’s 25 districts. Announcing the compensation scheme for those affected by the recent floods and landslides, the Government said Rs. 100,000 will be paid for a death while property damage will be compensated up to a maximum of Rs 2.5 million. Another Rs. 2 billion was allocated yesterday to be disbursed as soft loans to assist with small- and medium-scale businesses affected by the floods. The Government has decided to channel all the monetary assistance provided towards rebuilding damaged houses. According to a UN Resident Coordinator Flash Update, Japan has committed to donate emergency relief goods (tents, plastic sheets and sleeping pads) through the Japan International Cooperation Agency, while Australia promised assistance worth Rs. 57 million (A $ 500,000) to meet urgent needs, including the deployment of high-grade inflatable boats and outboard motors to expedite search and rescue efforts. These vessels will arrive in Sri Lanka by airfreight as soon as possible, a statement released by the Australian High Commission said. Teams from the Office of US Foreign Disaster Assistance (OFDA) and the European Civil Protection and Humanitarian Aid Operations (ECHO) are en route to Sri Lanka to assess the situation in support of local partner organisations, the UN report also said. At a special meeting convened by President Maithripala Sirisena on disaster management, decisions were made to amend Government circulars to improve efficiency and quality of immediate relief measures taken by welfare sectors. Accordingly, the allocation for a cooked meal per person was increased from Rs. 225 to Rs. 300, responding to requests made by District Secretariats, while the allocation for dry rations for a week was upped from Rs. 700 to Rs. 900 for one person, Rs. 900 to Rs. 1,200 for a family of two, Rs. 1,100 to Rs. 1,400 for a family of three and Rs. 1,300 to Rs. 1,500 for a family of four. The Meteorology Department forecast heavy rains today as cyclone ‘Mora’ moved to Bangladesh. However, normal monsoonal conditions will resume from tomorrow. The Disaster Management Centre cautioned affected communities over returning home too soon as the flood threat was still present. “Since the weather forecast says that there will be rains, we are vigilant. We would not advise people to return till tomorrow,” DMC Director General P. Liyanage told Daily FT. 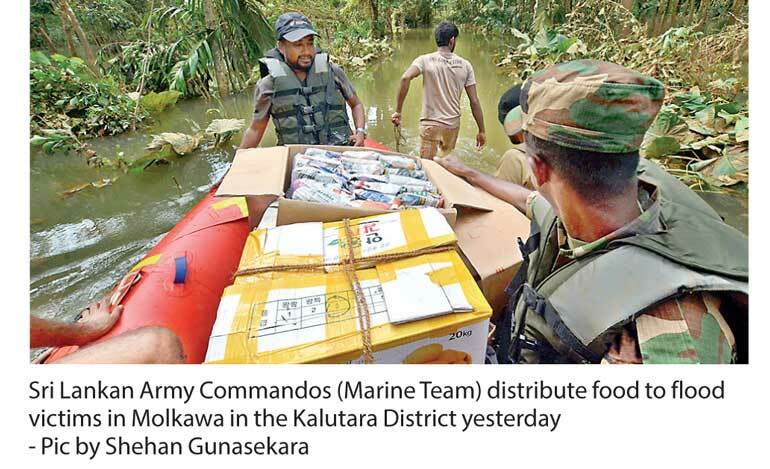 The Sri Lanka Army has deployed 3,600 troops for ongoing search and rescue operations, while another 1,500-strong team has been dispatched to provide relief services, including the distribution of meals and medical and evacuation assistance. Despite not finding a single survivor among those who have been missing, Army Spokesperson Brigadier Roshan Senevirathne said search operations would continue. “We have not abandoned the mission, it is not possible to assume that those listed missing are dead,” he told Daily FT.
Sri Lanka army troops have been able to access a number of areas in the Ratnapura and Kalutara districts which were cut off due to landslides. “We were previously not able gain access to two main landslide sites - Pahiyangala in the Kalutara District and Aayagama in the Ratnapura District. Now we have established access,” Brigadier Senevirathne said. Taking preventive measures against the spread of diarrhoea and skin infections as affected communities return home from shelters as the water levels recede, the Health Ministry has deployed medical teams from Colombo to cater to any medical requirements of the communities. “We were able to contain the spread to a minimum during the 2016 floods as well. We have taken preventive measures similar to last time to curtail any spread,” the Minister said while speaking at the daily press briefing held by the Disaster Management Centre in Colombo. Making an appeal for donations of relief items, especially water pumps to be used for clean drinking water wells that are submerged in water, the Government set up hotlines to coordinate the collection of assistance. Death toll from floods and landslides over the weekend rose to 196, with over half a million people displaced, the Disaster Management Center (DMC) said. Another 93 people are still missing and 63 are injured. The DMC said 622,510 people belonging to 140,000 families were affected in 15 Districts due to the flood situation.